Synaptic plasticity, one of the neurochemical foundations of learning and memory, is predominantly controlled by NMDA receptors. One of the hallmarks of Alzheimer’s disease is a neurological dysfunction caused by nerve cell damage, which in turn is caused by the over-activation of NMDA receptors. Currently, clinically available treatments for the disease are drugs that stimulate the actions of acetylcholine – a neurotransmitter in the nervous system – or inhibit the function of NMDA receptors. Published this month in Nature Neuroscience, a team led by Professor Kei Cho from Bristol’s Faculty of Medicine and Dentistry, detail how they discovered a novel interaction between NMDA receptors and muscarinic acetylcholine receptors (mAChRs), whereby activating the latter can depress NMDA receptor function. This novel form of synaptic plasticity was located in the hippocampus, a centre of learning and memory in the brain.
" This is yet another example of how Bristol Neuroscience has brought together teams from different faculties within the University of Bristol to tackle some of the most important challenges facing society." This research was funded by the Biotechnology and Biosciences Research Council (BBSRC), the Medical Research Council (MRC), UK Alzheimer's Research Trust, The Royal Society and Brain Research Centre of the 21st Century Frontier Research Programme funded by the Korean Ministry of Education and Science and Technology. Health News is included on the IvyRose website to inform visitors about current health issues and research, but not to endorse any particular view or activity. Any views expressed in the article above are not necessarily those of IvyRose Ltd.. Material in this news item was released by the source indicated below on 19 September 2010 and may have been edited (e.g. in style, length, and/or for ease of understanding by our international readers) for inclusion here. For further information, please visit their website via the following link. 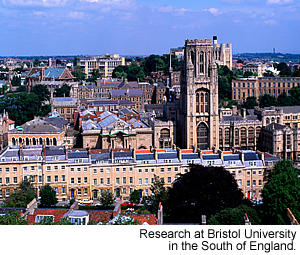 Source: Bristol University, England (UK) - Press Release.